In this post, I’ll discuss using a step gradient for peptide purification. Step gradients are commonly used in normal-phase small molecule purification and typically improve the purification efficiency while reducing the overall purification time. I have already discussed several strategies that may help improve the overall purification quality, including changing the mobile phase modifier and using mixed stationary phases, but one strategy often overlooked is the step gradient. I started down this experimental path with a peptide that I struggled to purify with a linear gradient. Although some impurities were resolved, the analytical HPLC-MS showed a trailing shoulder, indicating an impurity was still present in my sample, Figure 1. 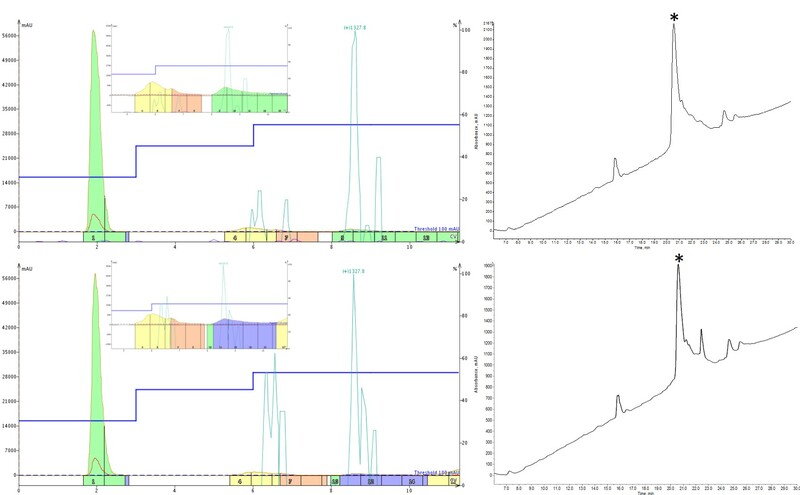 Figure 1: Purification of HA2-TAT, a 33-amino acid peptide, using an optimized linear gradient (left) and the analytical HPLC-MS characterization (right). Fractions 9 and 10 were combined and evaporated prior to the analytical characterization. The significant product peak (marked by asterisk) tailing suggests impurities are co-eluting. To design my step gradients, I used the “optimize” button on my Isolera™ Dalton 2000. This feature allows you to select a peak of interest collected during a linear gradient and designs a step gradient optimized for the selected compound of interest. You do have to be a little careful using this feature for peptides as the software will likely choose an initial condition which would not allow the peptide to be retained by the column. It did provide a good reference point for which concentration of MeCN I should use to elute my peptide of interest. As a first attempt, I naively thought that I could achieve my purification goals in a single step, jumping from my initial conditions of 30% up to 55% (the MeCN concentration recommended by the software optimization), Figure 2. Boy was I wrong. Stepping up to such a high MeCN concentration prevented the early eluting impurities from being resolved and separated out. As a result, everything co-eluted. On the bright side though, some impurities were removed and this gave me a starting point for how to further optimize the step gradient. Figure 2: Purification of HA2-TAT, a 33-amino acid peptide, using a step gradient (left) and the analytical HPLC-MS characterization (right). The peptide was purified using an isocratic hold at 30% MeCN (3 CV) then a step to 55% MeCN (6 CV with auto-extend). The purification is somewhat improved over the linear gradient, but the previously resolved early eluting impurities are now co-eluting. With each successive gradient change, I either added additional steps or changed the MeCN concentration held during a step, allowing impurities to more fully resolve before stepping to a higher MeCN concentration, Figure 3. The one thing I was diligent in keeping constant though was the length of each isocratic hold. I chose to hold each step for 3 column volumes to ensure that the cartridge was fully equilibrated at that condition such that any compounds could elute before another drastic change in MeCN. Figure 3: Optimization of step gradients for peptide purification. The first optimization included an additional intermediate step and incorporated isocratic holds at 30% (3CV), 45% (3CV) and 55% (3CV) MeCN (top). The second optimization retained the additional intermediate step and incorporated isocratic holds at 30% (3CV), 45% (3CV) and 53% (3CV) MeCN (bottom). Each iteration shows improvement in the final sample purity. While still not perfect, the last step gradient I tried showed marked improvement in the final purity of my peptide when compared to the linear gradient I started with, Figure 4. The most interesting observation was how much difference holding at 53% rather than 55% MeCN could improve the purity. It just goes to show that significant purity enhancements can be achieved for peptides with small changes in MeCN concentration. Figure 4: HA2-TAT purification with 3 isocratic steps. The purification included an isocratic hold at 30% (3 CV), 45% (3CV), 53% (3 CV) and 60% (3CV) MeCN. This purification resulted in the purest sample of the conditions evaluated thusfar. These results clearly demonstrate the utility of using step gradients for peptide purification. Although the time savings often felt for small molecule purifications wasn’t really felt for this peptide, the improvements in final peptide purity came without a significant increase in purification time. What purity have you achieved using a step gradient for your peptide purifications? Previous Previous post: How long should I let my cleavage reaction stir at room temperature? Next Next post: How does methanol as a mobile phase solvent impact peptide purification by reversed-phase flash chromatography?